MELBOURNE (MarketWatch) -- BHP Billiton Ltd.'s (BHP.AU) strict (??? see below) environmental guidelines mean it could decide to sell Rio Tinto Ltd.'s stake in the Grasberg copper and gold mine if its bid for Rio is successful, analysts say. BHP has since 2001 opposed (retreated from?) the dumping of waste materials from the processing of ore, known as tailings, directly into rivers, something that occurs at the Grasberg mine. BHP wouldn't comment directly on Grasberg and appears to be leaving the door (pipe?) open for the merged entity to maintain a stake in the rich mine, despite its waste disposal practices (naturally). The possible dilemma for BHP indicates that, along with many synergies from a merger with Rio, there would be some bumps (tailings?) in the road (river?) along the way. BHP has proposed an all-equity offer for Rio Tinto, but Rio has dismissed the proposal as significantly undervaluing the firm. Analysts say any sale of Rio Tinto's 40% stake in Grasberg could fetch up to US$4 billion and there would be no shortage of willing buyers. Grasberg is one of the world's most profitable mines and also one of the biggest copper deposits, with reserves of 2.8 billion metric tons of ore containing 54.8 billion pounds of copper and 54.3 million ounces of gold as at Dec. 31, 2006. 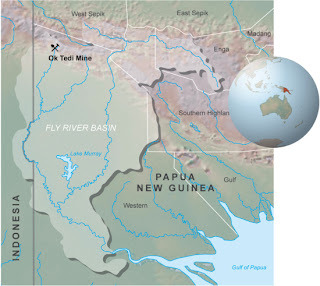 Tailings from the mine in the province of West Papua, which is majority owned by Freeport-McMoran Copper & Gold Inc. are discharged directly into the local river system and then deposited on a floodplain. The tailings disposal methods at the mine have been attacked by environmentalists and the operation has also been caught up in controversies relating to the local independence movement. BHP declined to comment on Grasberg Tuesday but appeared to leave the door open to keeping the Rio Tinto stake, pointing out its environmental policy applied to existing projects (loophole #1). "We have publicly committed not to pursue deep sea (so the mid-oceanic trenches are protected?) tailings placement as a potential tailings disposal option for any of our current operations," a spokeswoman told Dow Jones Newswires. BHP also pointed to its sustainability report (2006), in which it vows, "not to commit to any new mining project that disposes of rock or tailings into a river". (sounds fabulous) But the report goes on to say this does not apply to material in conventional tailings dams (loophole #2), which may be constructed within river systems where the structures are designed to retain and store materials. Nor does it apply (loophole #3) to the discharge of water from tailings dams or waste rock dumps that is of a quality acceptable for downstream beneficial (mine tailings waste?) uses according to the report. These caveats look to give BHP some room to maneuver (goes without saying) if it wants to keep Rio Tinto's Grasberg stake.